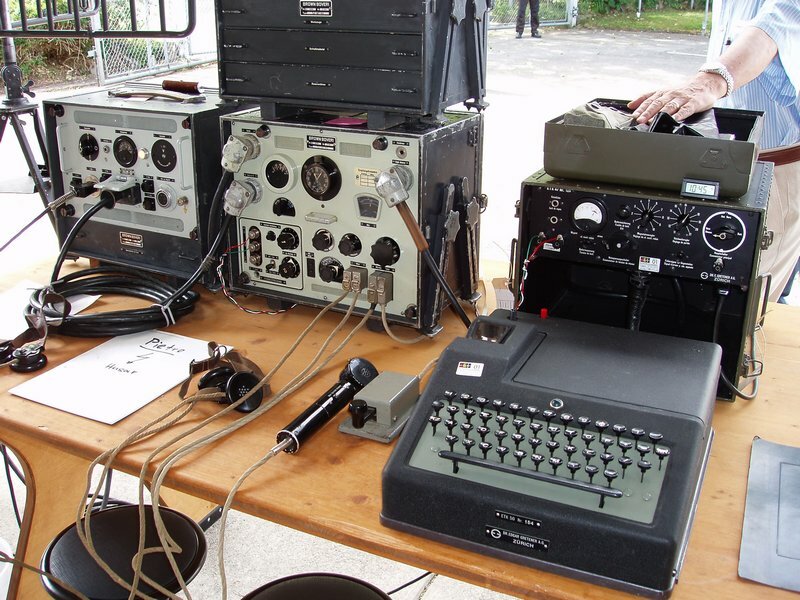 It was not before the World War II years, when interest in using high frequencies in the VHF range for communications arose also in Switzerland. 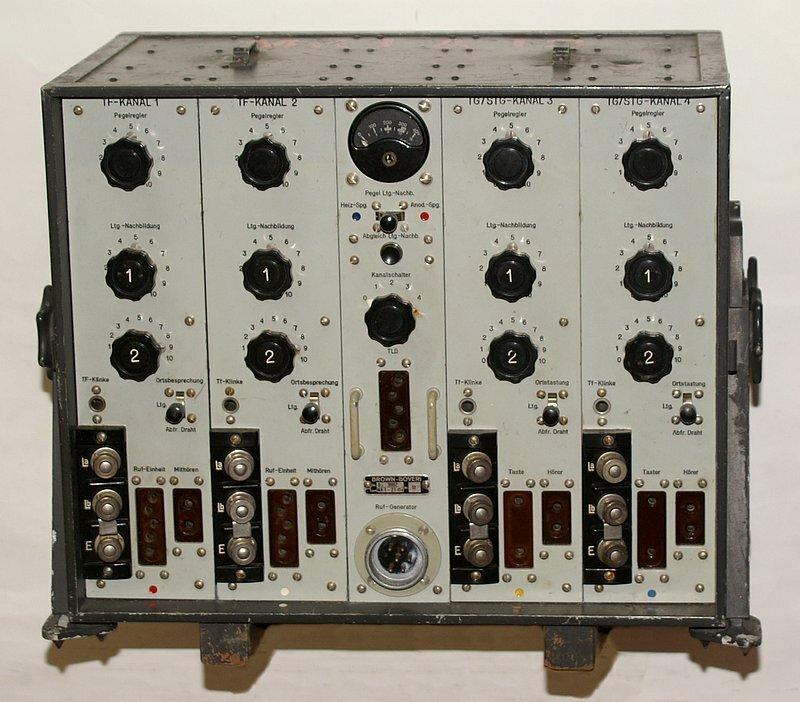 After a prototype station successfully could be used to establish a communication link between St. Chrischona near Basel and a mountain top station at Jungfraujoch, the War Technical Section (KTA) gave the order to develop a microwave communications system capable of multi-channel transmissions to Brown Boveri Corp. in Baden. Because of the good results in practical use with the troops with the TL station, the concept of the TLD station was very similar with it's portable components. The main part of the circuitry is found in the transceiver case, the R.F. final stage and tuner is found in a small case attached to the directional antenna (to keep cable loss low), a mains power supply, a motor generator and a pedal-operated generator make also part of the TLD. Brown Boveri delivered seven prototype stations with the designation SET 9/2 in August 1943; from the definite version with BBC designation SET 11/2 a houndred sets have been ordered in 1943 and another fifty stations in 1944. Because of production delays in the war years (problems with valve supply due to the War and export restrictions caused Brown Boveri to produce th R.F. pentode P2 in Switzerland), the station came in service not before the end of WWII in Mai 1945. The TLD found no good resonance with the troops: the station suffered from very frequent dropouts mostly from bad contacts at the tube sockets. Insiders knew, that the valve contacts had to be cleaned with a metal brush or the Swiss pocket knife before switching on the station. Another problem was the fact, that with the standard setup, the station could transmit only one channel. The Swiss Army had ordered far too few of the multichannel adaptors - so the TLD was not found very useful in practical use: there was no service communications line to be used in parallel with the main operative communications channel. The station has been in use until 1960, it has been used for point-to-point connections only. Only with the introduction of the successor, the Brown Boveri made MT 3, microwave communications has found more frequent use with the Swiss Army. The TLD is capable no only of telephony but also of radioteletype connections with the letter printer ETK, in connection with some encryption equipment, automatically encrypted communications were possible. The main part of electronics is located in the transceiver case, the high power oscillator with the two LD1 finals is located in a small case attacked to the directional antenna. The two final triodes in push-pull arrangement will generate 1,5 Watts output power in the 330 - 355 MHz band range. On the transceiver's front panel, You find next to the station clock the frequency dial, just below the main tuning knoband the mechanical tuning lock. The modes switch is located below the colume control. 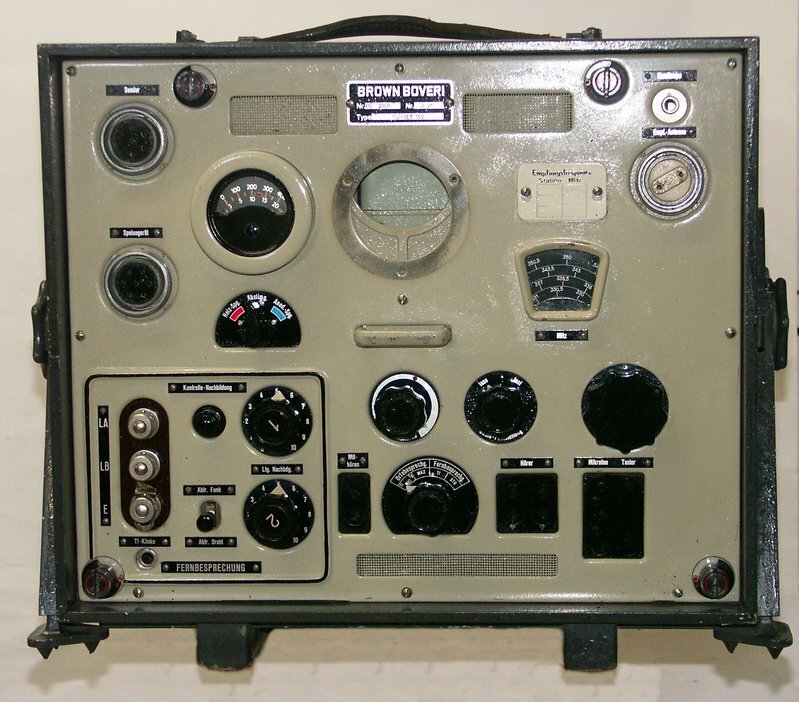 In the right lower corner, You find the jacks for headphones, microphoneond the Morse key, in the left lower corner the jacks to connect the set to a field telephone line, the remote control and audio level control. In the left upper corner, You find the connectors for the receiver antenna and the cables to the transmitter and power supply, a meter can be switched to control heaters and anode voltages. The receiver circuit is the one of a standard super het, without preamplification, the antenna R.F. signal is mixed (D1d / EA50) to a first intermediate frequency of 16 MHz. After four I.f. amplifier stages (P2d) and the limiter stage (P2d), the signal is demodulated in the discriminator stage (2 x D1d / EA50). The A.F. stages (2 x P2d) will feed the audio signal to headphones or the field telephone lines. The power supply delivers all necessary heaters and anode tensions, in the accessory drawers, You find a lamp socket power adaptor (the searched-after adaptor that can be screwed in a lamp socket with two power sockets) and some spares. The station can be powered from a fuel operated generator or for emergency use from a pedal-operated generator, as an alternative to mains operation. The pedal-operated generator marked with a red ring provides the heaters voltage of 13 V and the anode voltage of 360 Volts.